19.04.1930 — 02.04.2006 Dearly loved Wife of Bill, loving Mum of Kathy, Mark, Di, Carol, Tom, Dean, Wayne, Peter, Adeline, Anne and June. 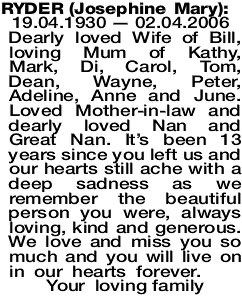 Loved Mother-in-law and dearly loved Nan and Great Nan. It's been 13 years since you left us and our hearts still ache with a deep sadness as we remember the beautiful person you were, always loving, kind and generous. We love and miss you so much and you will live on in our hearts forever.